This is a true story of a "ditching" which happened to a Royal Air Force aircrew of Squadron No. 518 on 21st November, 1944 based on the Isle of Tiree in the Outer Hebrides, flying a Halifax aircraft No. LL510. The operational duty of this Squadron was to obtain and collate meteorological data over the North Atlantic, the main sortie being the Bismuth sector 600 miles due west. Depending on the weather condition this could produce a flight of around 11 hours. Because of the length of the flight all aircraft were given an air test by the duty crew on the day of the operational sortie, to ensure all aspects of the aircraft were in tip-top condition. 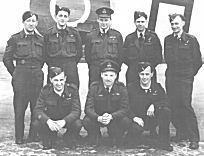 I was the navigator of this crew, which numbered 8, but on this air test we were joined by an engine fitter who "came along for the ride". Soon after we were airborne, the starboard outer engine caught fire. My skipper "feathered the propeller" and pressed the fire extinguisher button but nothing happened, if anything the fire seemed to increase. The flames were so intense the skipper realised that it would be impossible to make a circuit and return to base, so he decided to "ditch" and sent out a "Mayday" signal. Looking at the fire, which stretched from the engine to the tail fin, I was concerned that the tip of the wing might break off due to the heat, in which case we would have spun in; or that the fire would reach a petrol tank and cause us to explode. The recent Concorde fire made me think that our situation could have been identical, except that we were over water. Despite a 30ft swell, the skipper sat the aircraft on the water spot on. The perspex nose of a Halifax contained an immersion switch which, on contact with the water, blew up a dinghy stowed in one of the wing housings. We all had various positions to take up in such an emergency, mine was lying on the floor with my feet braced against the main spar. To give me moral support my arms were wrapped around our met observer, who was lying between my legs! On contact with the Atlantic Ocean the nose broke up, a wall of green water rushed towards us and I thought my number was up. When people comment that in situations like this "one's life flashes before you", I can certainly vouch for it. Fortunately, we all scrambled out of the escape hatches free of injury, except our skipper who sustained a scratch to his face. The relief of seeing the dinghy bobbing up and down in the water was immense. An American Airforce Liberator was heading our way. A Sunderland flying boat was flying up from Northern Ireland. A RN Corvette was steaming up from Northern Ireland. The CO of our station rushed down to dispersal and ordered the only available aircraft (which had been declared unserviceable) to be started up. A local fisherman, living on the island of Tiree, was rowing out to our assistance. An Air-sea Rescue squadron, based on the island with us, was scrambled. Finally a small RN minesweeper - HMS Flanders, operating a few miles north, saw the Halifax ditch and steamed south at full speed. In spite of all this rescue activity we were not yet out of danger. The water surrounding our ditched Halifax was a sea of petrol. In the middle, to our horror, was a fuel tank that had broken lose which was bobbing around with flames issuing from a hole. Our luck was in that day, however, and the aviation fuel did not go up; had it done so, it would surely have taken the entire crew with it. Initially there was not enough room in the dinghy for all nine crew to sit on the edge. Three of us (yours truly included) were forced to kneel in the well of the dinghy with a load of water which we had to bail out. The situation was marginally improved when the Air-sea Rescue aircraft from Tiree arrived on station and dropped a further dinghy. Myself and two colleagues transferred to the second boat, but it was still no picnic! Our dicey predicament, floundering in a 30ft swell in the North Atlantic on a bleak November day, was eased significantly with the arrival of HMS Flanders. She delicately manoeuvred alongside us to pick up eight airmen and a much-relieved fitter who was more than happy to be out of the "drink"! I was lifted from the dinghy onto the deck of the minesweeper and immediately collapsed. The ship's skipper came along the deck with a stone keg of naval rum, which he administered to us quite liberally. The crew of the Flanders were fantastic - they plied us with hot soup, warm food, more rum, and then fitted us out with survivor's gear. I came ashore dressed completely, down to my shoes and socks, as an Able Seaman - and with a stomach full of rum! Back at the station word soon flashed around that we had crashed, but initially no details were available. Many of the WAAFs were deeply distressed - or so we were told. When we docked at Tiree Port we were greeted by the Medical Officer (with the Station Blood Wagon and more rum) together with most of the senior pilots who had raided all the available aircraft for Verey pistols and cartridges in order to welcome us with a firework display. That night the MO packed us off to bed in the hospital where we were all given a sleeping pill, but no one slept as the skipper of the ship paid us a visit with yet more rum! We were all given survivor's leave. One of our wireless operators, who had not contacted his mother by phone or letter, was greeted by her on knocking on the door with the words "you've been in an accident"! In conclusion, due to the skill of our skipper Flt/Lt Freddy Green who was in my view the best of the best on 518 Squadron, we all lived to tell the tale.